>> Oxford, England label concern Big Scary Monsters disclosed today it will release Philadelphia-based emo heroes Algernon Cadwallader's absolutely devastating, devastating sophomore set in Europe next month. The new collection, Parrot Flies, will be issued Aug. 22, right after the trio completes a 32-date tour of Europe and the UK that commences tomorrow. Big Scary Monsters' European iteration of Parrot Flies is available for pre-order now on CD or 12" vinyl. The vinyl is in an edition of 500, with 200 transparent blue discs and 300 black discs; BSM also has an exclusive t-shirt offering, and you can see all your merch options right here. 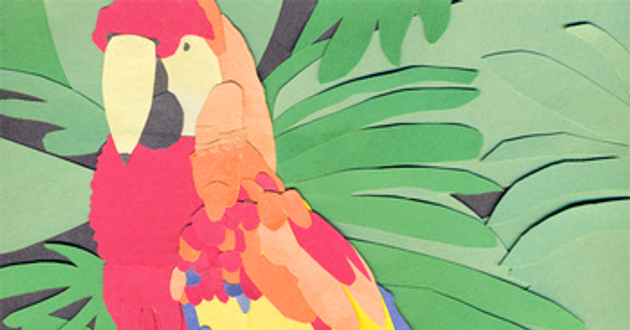 More importantly, you can also stream all of Parrot Flies via the Soundcloud embed below. Download the final track "Cruisin'," which showcases well the band's characteristically unbridled energy, noodly and melodic guitar lines and damaged vocals, for free right here. We checked in at Algernon Cadwallader's web dojo a couple days ago and as far as we can tell Parrot Flies as yet has no US label attached to it, although the band was hoping to sell copies on the West Coast leg of its just-wrapped US tour. >> Johnny Foreigner singer and guitarist Alexei Berrow will make his solo debut at a live gig later this month. Operating under the characteristically cheery name Yr Dead Friends, Berrow will play "a load of depressing songs on his own that you've never heard," which impresses us to no end because it means Lex is even more of a song-writing machine than we had heretofore appreciated. The guy writes a lot of songs; it's amazing. Anyway, the gig is at Trinity in Harrow, which the Internetzez tells us is in North London, and Yr Dead Friends will be supporting Johnny Foreigner's Alcopop! labelmates Ute and Uxbridge-based emo/math-ers I Saved Latin. Someone bootleg this gig for us pretty pretty pretty please? Your brief Johnny Foreigner update then: the band has recorded a tonne of songs for their third full length, which is expected out later this year. So many songs, in fact, that the band is worried the potential length of the record may be more than the average listener can bear. Frankly, we hope they put every damn song on the album. No one is more ready to make a double or even triple record than Johnny Foreigner. We'll keep you posted.